The leaders of South and North Korea agreed to “adopt practical steps” to connect and modernize the now-defunct cross-border railway lines during the inter-Korean summit on Friday, suggesting that the two Koreas may officially restart efforts to restore and build a railway that spans across the Korean Peninsula. “South and North Korea agreed to actively implement the projects previously agreed in the 2007 October 4 Declaration, in order to promote balanced economic growth and co-prosperity of the nation,” the joint declaration from Friday’s summit reads. “As a first step, the two sides agreed to adopt practical steps towards the connection and modernization of the railways and roads on the eastern transportation corridor as well as between Seoul and Sinuiju for their utilization,” it said. The two railways referred to in the declaration are the Donghae and Gyeongui cross-border railways. 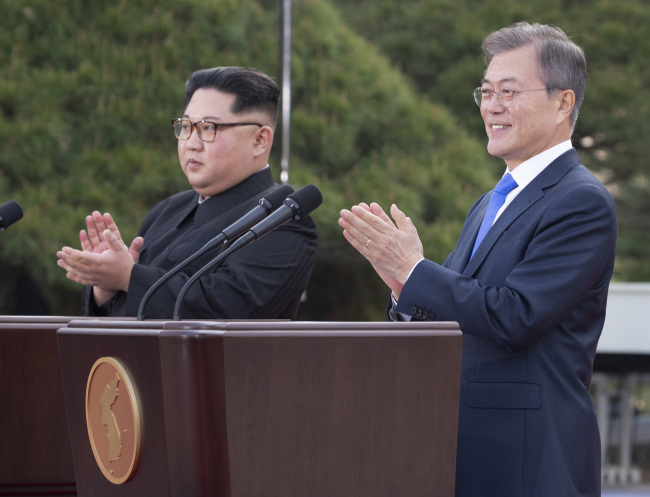 The agreement came after the two leaders had hinted at the possibility of an inter-Korean railway earlier in the day, discussing how the two nations could be better connected via the South’s high-speed train system. North Korea’s leader Kim Jong-un made a historic crossing to the South to hold talks with South Korea’s President Moon Jae-in at the truce village of Panmunjeom on Friday morning. During the talks, North Korea’s leader Kim Jong-un praised the quality of South Korea’s high-speed train system in Pyeongchang, while citing worries that if Moon were to visit the North, he would be inconvenienced since the transportation infrastructure there is much less advanced. “If (Moon) comes to the North after living in the South, it may be embarrassing. We will make preparations for a comfortable visit,” Kim said. The South Korean president responded with hopes of restarting cooperation to build a railway connecting the South and North -- which the two sides had agreed on during previous inter-Korean summits, yet never put to action. “If the railroad is connected with the North, both the South and North can use high-speed trains. This is contained in the joint declarations of June 15 (2000), and Oct. 4 (2007), but it has not been executed over the past 10 years,” Moon said. “It is shameful that the flow (of inter-Korean cooperation) was severed due to changing inter-Korean relations. Chairman Kim’s bold decision has allowed the vein to be reconnected,” Moon said. The leaders’ remarks combined with what appears to be a thaw in inter-Korean relations boosts the possibility that the South and North could reinitiate steps to build a railway system connecting the two sides. Last month, the South’s Korea Railroad Corp. CEO Oh Young-sik told reporters that the company is preparing for the possibility that the two Koreas will agree to restart the South-North railway project during the inter-Korean summit. He said that the South-North railway project may become an important topic of discussion at the inter-Korean summit, citing examples of how it will bring positive outcomes for both nations. Events like family reunions and games between the two nations’ soccer teams could be hosted effectively via use of the trains, he added. Oh has also previous expressed confidence that the cross-peninsula railway project, if permitted by both countries, could become a reality in the near future. “In 2006, we even held a test run of the section of the Gyeongui railway line leading to Pyongyang. If (it is) wanted, we could supply trains right now and carry passengers from Pyongyang to Seoul,” he said. The South-North railway system is among the major economic projects that the two Koreas have been pushing for, including resuming operations of the jointly-run Kaesong industrial park in the North and restarting tourism to the North’s Kumgangsan. However, as the United Nations’ economic sanctions against North Korea are still in place, issues of economic cooperation were officially left off the discussion agenda at the inter-Korean summit.